Today, ambulatory surgery centers and surgical hospitals are challenged like never before to cut costs while maintaining patient throughput and quality. Effective supply chain management is key to running a successful and profitable ASC. There are several challenges to overcome in order to run an effective and efficient supply chain, and overcoming these challenges can help ASCs save in order to impact their bottom line. 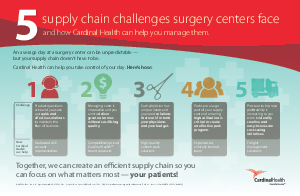 This infographic will help address the five challenges that surgery centers and surgical hospitals most commonly face, and provide solutions for how to overcome them.